At approximately 02:53 AM Officers spoke with victims that came to the police department and reported that someone broke into their house and stole their cell phones and an Xbox while they were at home. The victims stated they were asleep when they heard someone inside their home. The victims yelled at the suspect to leave at which time the suspect came upstairs and took both victims phones. He then took one of the victims downstairs while he took the Xbox before leaving. No one was injured and it is unclear at this time if a weapon was used. Investigators were called to the scene and are currently working the case. We are asking that anyone with information please contact the Detective Division at 662-232-2400 or CrimeStoppers at 662-234-8477. 2 Auto Burglaries – 400 Block of S. Lamar & 400 Block of Remy Blvd. 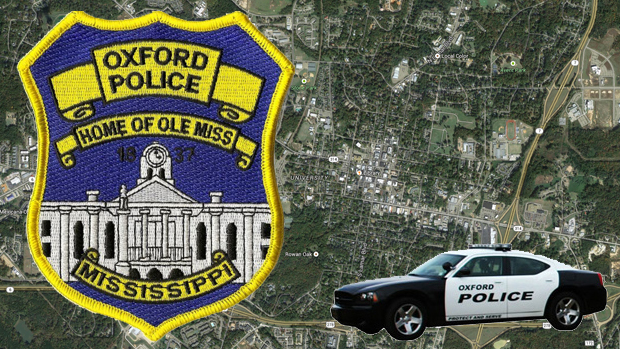 On February 18, officers of the Oxford Police Department responded to BancorpSouth in reference to a subject on scene attempting to cash a fraudulent check. Officers made contact with Jeremy Coleman and found that Coleman had cashed other fraudulent checks over the past several days. Coleman was arrested for Uttering Forgery and was taken before Judge Mickey Avent for his Initial Appearance. Coleman’s bond was set at $5,000.00. On Wednesday, February 17, 2016 Investigators of the Oxford Police Department served an arrest warrant of Nicholas Brown (21) of Oxford, Mississippi with one count of Burglary of a Commercial Building (97-17-33). Brown was arrested after officers were able to identify him breaking into WingStop over the weekend. Brown’s bond was set at $5,000.00. Armed Robbery – Campus Creek. Victim stated that he arraigned a meeting with a male subject to purchase $1,000 worth of marijuana. When he arrived the suspect told him to get in his car at which time he pulled a gun and demanded the victim give him all his money. A fight ensued and the suspect hit the victim multiple times. The victim called an ambulance and we arrived and began our investigation. At this time there have been no arrests and the case is ongoing. On February 4th the Oxford Police Department received information from the Olive Branch Police Department in reference to possible credit card frauds that occurred in Oxford. After further investigation, it was discovered that there were several incidents of credit card fraud that had occurred. These incidents took place at Home Depot, Office Depot and Kroger. The suspects, later identified as Deon Darden and Daniel Jackson, went into these store and bought multiple MasterCard gift cards in numerous amounts with fraudulent credit cards. On February 8th Darden and Jackson were located and arrested for credit card fraud. Both were taken before Judge Carolyn Bell for their Initial Appearance and their bond was set at $20,000. We have notified the individuals that had their credit card information stolen, they had no idea at the time. There could be more victims as we have learned that these men were working out of Memphis and possibly targeting the mid-south area. We are asking for all residents to check their credit card accounts to make sure they have not had their accounts used also. OXFORD, MISS (Feb. 9, 2016) – At approximately 3:00 pm on February 9, 2016 a 911 phone call came through dispatch reporting an unresponsive individual near 1543 South Lamar. Upon their arrival, EMS determined the subject to be deceased from an apparent self-inflicted gun-shot wound. At this time Oxford Police Department Investigators are still working on the details of the incident and no further information is available at this time. Officers took a walk in report late yesterday afternoon where they spoke with a victim that stated the previous night he was walking on Mall Drive ( Near Jackson Ave and the Intermural Fields) when a light colored sedan pulled up beside him. The passenger, black male, got out and told him to give him his backpack. The victim did not give a description of the driver, only that he was a black male. At this time we do not believe a weapon was used and cannot link this case with any of the other robberies. There were no injuries and the case is still under investigation. On Tuesday February 2nd 2016, Oxford Police Officers arrested John Henry Key 56,of Oxford. This was a result of a traffic stop for a seatbelt violation. Key was arrested for the seatbelt violation, no driver’s license & DUI 3rd. His bond was set at $2,850.00. On Wednesday, February 03, 2016, Investigators of the Oxford Police Department served an arrest warrant for Felony Embezzlement on Jason Bland (33) of Water Valley, MS. Bland was arrested after he was caught embezzling over $1,000.00 from Kangaroo Gas Station on Hwy 278 West his bond was set at $5,000.00. Jason Charles Holtgren (36) of Hammond, LA was found in Hammond, LA in possession of a vehicle that was stolen from Oby’s in Oxford, MS on 12/19/2015. Holtgren stole the vehicle and drove it back to his hometown and got into a verbal disturbance with his girlfriend and the Hammond Police Department was called. When Hammond PD arrived Holtgren fled the area on foot. A short chase ensued with Hammond PD taking him in to custody. While on scene they ran the tag to the car in the driveway and they were notified that the car was indeed stolen. Holtgren is currently in jail on a $175,000.00 bond in Hammond and a hold has been placed on him by the Oxford Police Department. Whenever Holtgren is cleared with Hammond Police Department, he will be transferred to our custody to face a judge for his Grand Larceny charge. On Sunday, January 31, at approximately 3:21 AM the Oxford Police Department arrested Robert Fortner(37 of Courtland, MS.) for Burglary and Kidnapping. Officers were dispatched to the corner of N. Lamar and Jefferson Ave. for a possible disturbance. The caller stated that he saw a white male and an older white female at that location and he believed the female was in distress. When officers arrived they found what they believed to be the same thing. As they approached the female she ran to them and the male, Robert Fortner, threw an object at the officers and began approaching in an aggressive manner. Officers had to take Fortner to the ground after he resisted their commands. Once Fortner was secure they were able to speak with the victim. She told officers that she heard someone outside her home and saw Fortner rummaging through her backyard. By the time she got out of bed and into the living area Fortner had already made entry. She attempted to call 911 but Fortner took her phone. She ran outside and Fortner chased her down. He told her that he was owed money and he was taking her to go get it. By this time they had made it to the corner of N. Lamar & Jefferson Ave. She was attempting to reason with him when a witness drove by and called us. The victim does not know Fortner and when Investigators interviewed him he had no knowledge of the events and believed he was in Tupelo, MS. We believe alcohol and drugs was a contributing factor. The case is still ongoing and Fortner was given a bond of $50,000. He has posted bond.